Personal branding is how you can shape others perceptions of your abilities to further your personal or professional goals. When you type an email, you’re branding yourself. If you have a conversation with a friend or family member, you’re branding yourself. How you dress, what you eat, and how you talk all contribute to your brand. Think of your brand as the summation of all the associations about you that are stored in people’s minds. Before: Jobs are for life, stay loyal to the company brand. Now: Loyalty is to your professional journey working with organisations that can support your aims. Before: Only businesses and organisations are visible online, branding is a corporate issue. Now: Social networks mean anyone who chooses to can become an online influencer. What you say as an individual counts. It sounds too good to be true, but by doing what you love work will be fun, you will be more motivated so you can earn more. Personal branding adds value to your job or enterprise and improves happiness - in and outside work.Focus on what you do well – be a super-hero (or heroine) within your strengths. Outsource your weaknesses. Use keywords to define what you do. These are words that you can use to attract the most website visitors (Search Engine Optimisation) which also align with your brand which you can use in all your content (talks, status updates on social networks, website, brochures). - Who is the audience for your products & services? - What are their values? Competitors – Who are you losing work to currently? What can you learn (and steal) from them? Comparators – Who are your peers? Who can you share with them and learn from them? Key influencers – Who do you aspire to be? How and when could you connect with them? First work on your ‘log copy’ versions for your website, brochure or CV: 200 words, 100 words, 50 words, 35 words, 20 words, 3 words. Where do you want to be – in 1 year? In 2 years? In 3 years? How do you want to be perceived in your specialism? Financial goals? Personal priorities? Be aware of the ‘traces’ you leave: the internet is an evergreen cache, good and bad content takes a long time to disappear. Create new content to bury older content. Re-highlight great content (e.g. refreshing articles, linking to past achievements). Don’t say anything online you wouldn’t want repeated. Make sure you know and control the level of privacy on your networks. 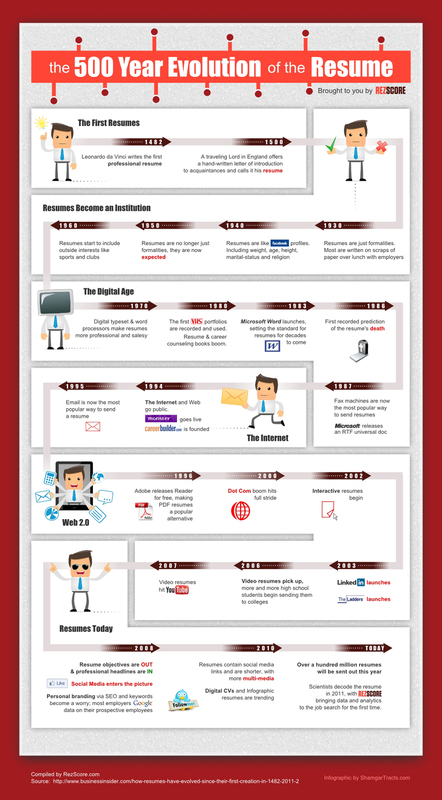 Check out this infographic from RezScore exploring how we approach the CV has (or hasn't) changed. The CV, when written right, does one thing, and one thing only: it gets someone interested in meeting you (in the context of an interview). Yet we hear of far too many stories from candidates of applications being rejected, or downright ignored by their ideal employer - who might or might not be employing at the moment. Due to inconsistent HR practices (website last updated in 2007!) most of the time, people have no way of telling whether it's the right time to approach. In such cases, as recruitment consultants, it's up to us to explain that that probably there's a myriad of reasons that an application was not considered - and it probably has less to do with the CV itself as with the people reading it at the wrong time. A well-designed CV definitely helps but in most cases the reaction seems to be: "if I can only make my resume a little bit better I am sure I can get that meeting." The truth is that reason isn't even always related to the CV itself, but rather to other people's more timely expressions of interest, too many applicants, or a busy HR department in dire need of helpful advice from people close to candidates. Maybe, due to this long traditional approach towards recruitment people can fail to look beyond this highly-charged document called the CV, and engage in stunted initial interactions based on knee-jerk impressions. Maybe companies (and us recruiters, as well HR departments) should look past the CV a bit more. Peek out into who's out there, so to speak, ready to connect and talk. Ask questions, explore more. Who knows if you just turned down or ignored the golden candidate who can turn your company around, given the time and resources? One simple thing we can do to make talent finding and HR friendlier and less of a barrier: whether you're a job seeker or a top recruiter, don't let your online networking profile languish; explain the reasons behind that connection request, and follow up with the right questions and advice. What's your opinion? Does the CV hold too much of our collective captive imagination? This great presentation is worth way more than the five minutes you will spend clicking through it.